Often abbreviated as CBS. This however may lead to confusion since citrus bacterial spot uses the same abbreviation. Many of the common names for black spot are based on observed symptom types but all refer to the same disease which can be confusing. The symptom based names are: hard spot (shot-hole spot), false melanose (speckled blotch), freckle spot, lacy-spot, cracked spot and virulent (spreading or galloping) spot. 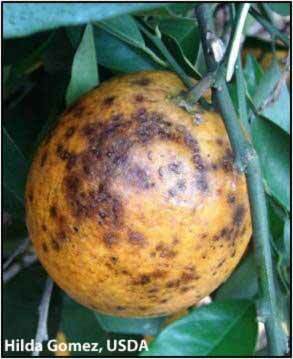 As in many diseases, timing is important for black spot to occur. Inoculum in the leaf litter needs to be available during the period when the host is susceptible and the environment is favorable for infection. Fruit are susceptible from fruit set until 5-6 months later, when they become age resistant. Both the ascospores (sexual spores) and the conidia (asexual spores) of G. citricarpa are able to infect susceptible tissues. Ascospores are found in microscopic fungal structures embedded in the leaf litter. They are the most important source of inoculum, in some regions causing nearly all infections. Ascospores have never been found in fruit lesions or lesions on attached leaves. Spores are released when the leaf litter is wetted by heavy dew, rainfall, or irrigation and can be carried by air currents over long distances. 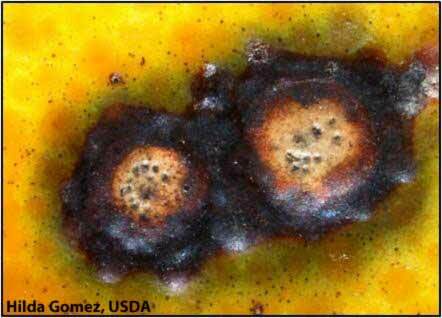 Dark brown or black pycnidia, structures that produce conidia, are formed on fruit, fruit pedicles and leaf lesions. They are also abundant on dead leaves. Conidia are not wind-borne, but may reach susceptible fruit by rain splash. These spores are not considered a significant source of inoculum in climates with dry summers; however, in climates with frequent summer rains, conidia play a larger role in the epidemic when there are multiple fruit ages present on trees simultaneously. Often late hanging fruit with lesions remain on the tree and spores can be washed onto young susceptible fruit. Infections are latent until the fruit becomes fully grown or mature. 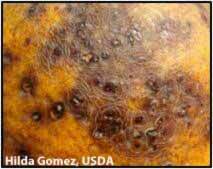 At this point the fungus may grow further into the rind producing black spot symptoms months after infection, often near or after harvest. Symptom development is increased in high light intensity, intensifying temperatures, drought, and low tree vigor. Leaf - older lesions are small, round, sunken necrotic spots with gray centers. The lesions are bordered with a dark brown ring. Young lesions are small, reddish, and slightly raised. A yellow halo can be associated with the lesions. 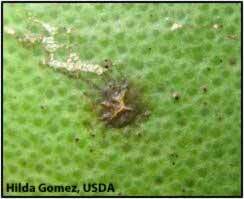 Foliar lesions are most commonly seen on lemons. They are rarely seen in well managed groves. Similar lesions can be seen on twigs and pedicles. 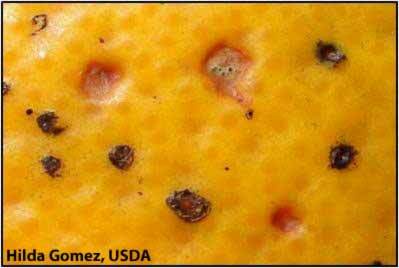 Fruit - lesions on fruit are so diverse that lesions are grouped into several types: 1.) hard spot; 2.) false melanose/speckled blotch; 3.) freckle spot (early virulent spot); 4.) virulent spot; 5.) lacy spot; 6.) cracked spot. Hard spot (1) is the most typical and diagnostic symptom of black spot as the fruit mature, often appearing around color change. The lesions are circular depressions with a diameter of 3-10 mm (0.12 - 0.4 inch). The brick red lesions have tan to grey centers with a distinct brown to black margin. Pycnidia are usually, but not always, present in the lesions. Pycnidia appear as small black dots and are visible with a hand lens but can be confused with acervuli of Colletotrichum spp. 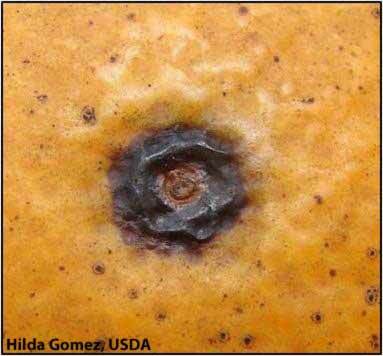 Preharvest, hard spot lesions tend to develop on the side of the fruit exposed to sunlight. False melanose/speckled blotch (2) symptoms appear as numerous, small (< 1 mm (0.04 in) in diameter), raised, brown to black lesions. Most frequently, false melanose occurs on green fruit. The lesions can coalesce as the season progresses and do not contain pycnidia. False melanose/speckled blotch-type symptoms can develop into hard spot-type symptoms at the end of the season. Freckle spot (early virulent spot) (3) symptoms are a sign of heavy infection. They occur on mature fruit, most often after harvest but can be seen when fruit is on the tree. The lesions are 1-3 mm (0.04 - 0.12 in) diameter depressions, potentially with pycnidia present. Lesions can be several colors, most often reddish with a dark red to brown border, but may be gray to tan, brownish, or have no color. Late in the season or during storage, freckle spot can develop into virulent spot or hard spot. Virulent spot (4) lesions are sunken and irregular in shape and occur on heavily infected, mature fruit toward the end of the season. In high humidity, large numbers of pycnidia may develop. 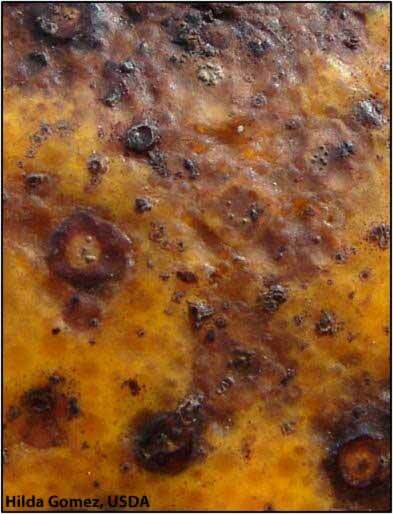 The lesions can turn brown to black with a leathery texture that eventually covers the entire fruit. 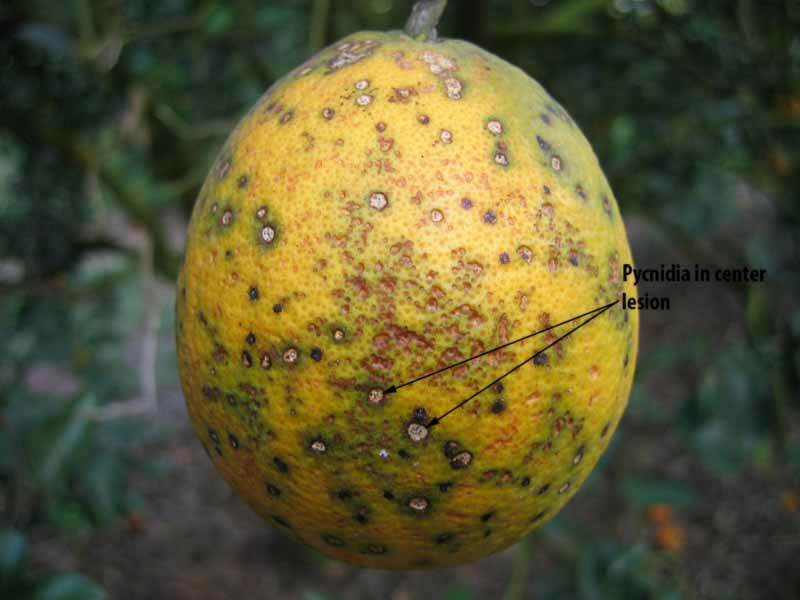 Virulent spot may cause premature fruit drop and serious post harvest losses since the symptoms may extend into the fleshy part of the fruit. Lacy spot-type (5) lesions are superficial, small, and yellow with dark yellow to brown centers and no defined margins. The fruit is still green when the lesions become apparent and can cover a large portion of the fruit surface. These lesions are considered to be a variation of false melanose. This term is not commonly used, and these symptoms have only been reported from South America. Cracked spots (6) type lesions are superficial, slightly raised, variable in size, brown to black with cracked surface and irregular margins. Pycnidia are not present in the lesions. 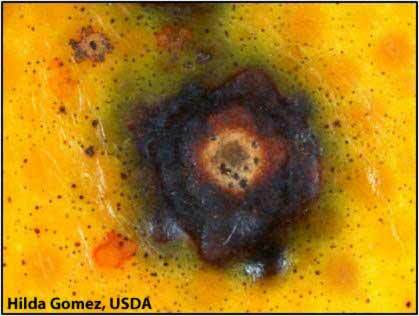 These lesions have often been associated with rust mite damage. Hard spot lesions can eventually form in the center of the lesions. 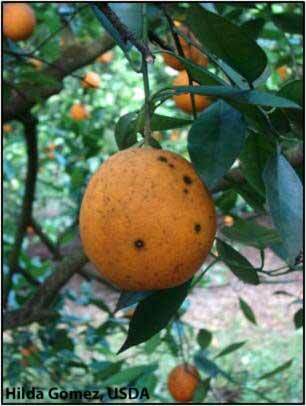 Citrus black spot affects all species of cultivated citrus and their hybrids. With the exception of sour orange and its hybrids, all commercially grown citrus species and cultivars have been observed to be affected by the disease. Lemon is particularly susceptible, and it has been observed that when citrus black spot moves into an unaffected area it first appears on lemons with the exception of the epidemic in Florida. Grapefruit and Valencia orange are also highly susceptible. 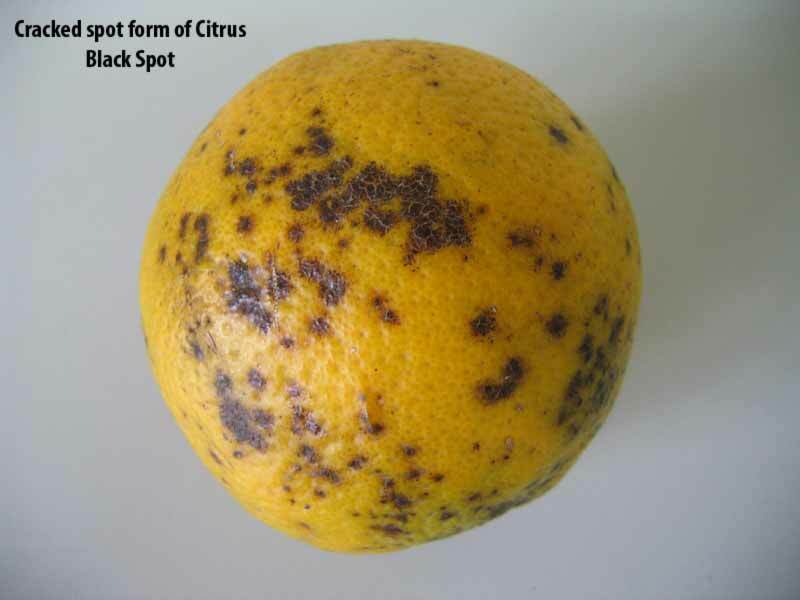 Citrus black spot is found in Argentina, Australia, Brazil, China, United States (Florida), Indonesia, Japan, Kenya, Mozambique, Nigeria, Philippines, South Africa Taiwan, Uruguay, Venezuela, and Zimbabwe. No reports have been made from Mediterranean countries. 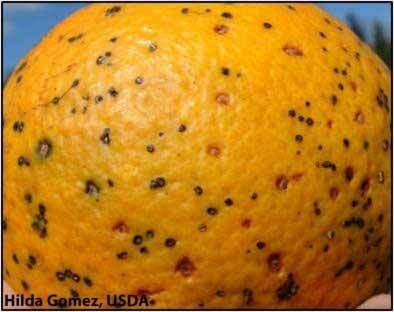 Hard spot form of citrus black spot on fruit. 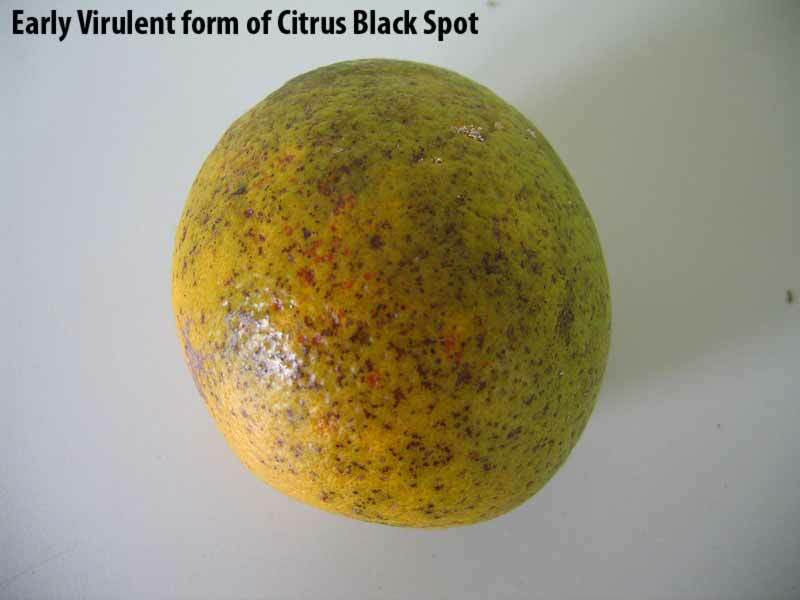 Citrus Black Spot symptoms are frequently numerous and irregularly distributed on the fruit peel. 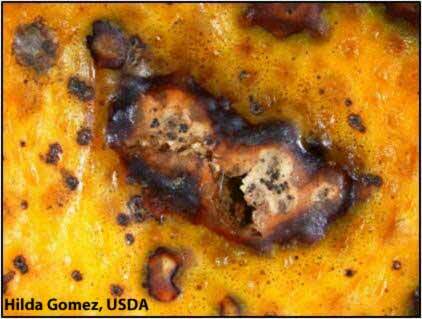 Pycnidia in center of lesions on fruit. 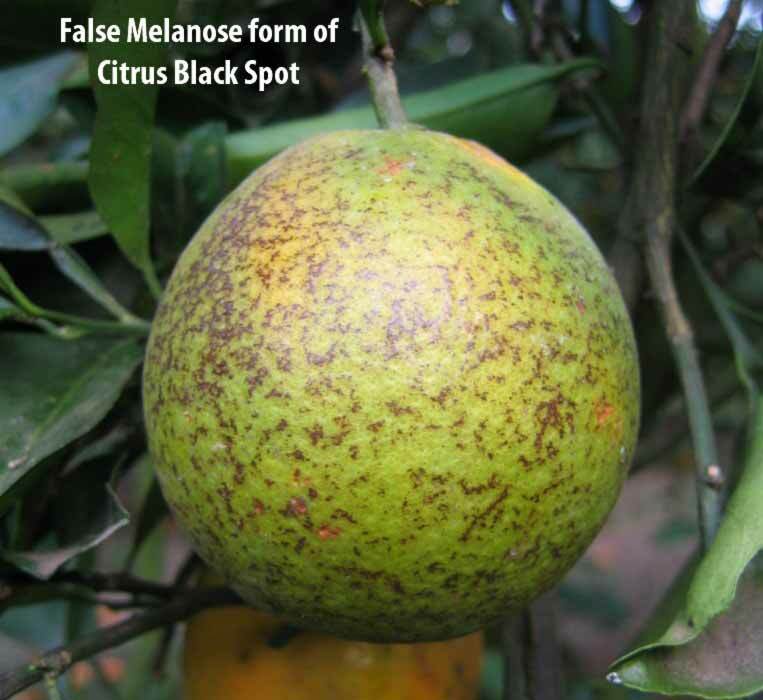 False melanose form of citrus black spot on fruit. 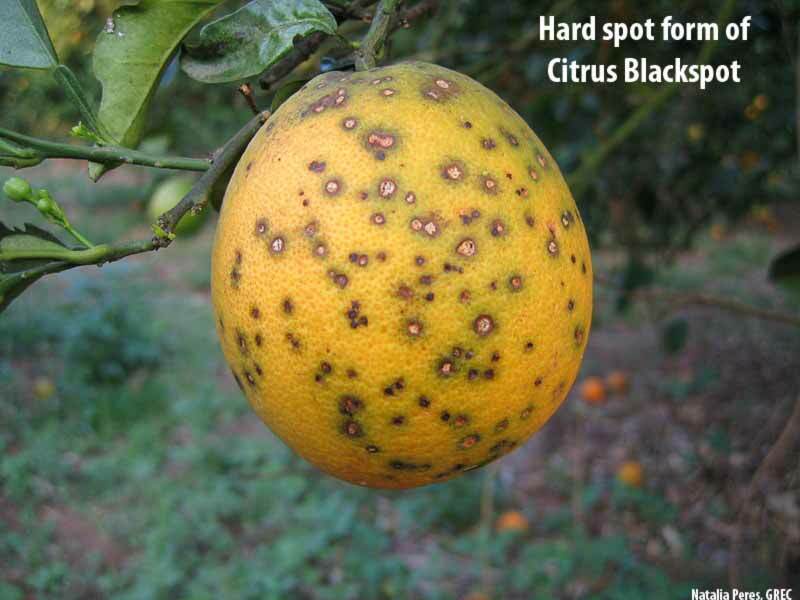 Early virulent form of citrus black spot on fruit. 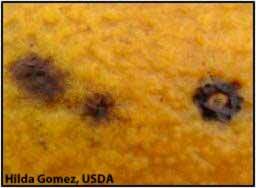 Cracked spot form of citrus black spot on fruit. Advanced stage of a hard spot lesion showing a tan center and the brick-red raised border on fruit. "Freckle spot" symptom type or "early virulent spot". Reddish or colorless spots on fruit lacking a halo which are a sign of heavy infection. Close up of "freckle spot" symptom type or "early virulent spot" on fruit. Reddish or colorless spots lacking a halo which are a sign of heavy infection. "Virulent spot" symptom type. Fusion and expansion of many lesions covering part of the surface of heavy infected fruit giving a lathery appearance. "Cracked spot" symptom type on fruit. Lesions with cracked surface and irregular margins. 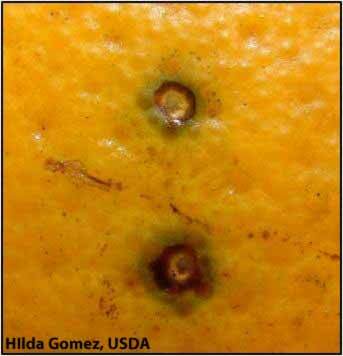 Close up of "Cracked spot" symptom type on fruit. Lesions with cracked surface and irregular margins. Symptom on green fruit that can become hard spots later in the season. "Hard spot" symptom type on fruit. This is the most typical symptom of CBS. Usually appears between the beginning of yellow coloration and maturity. Early stage of hard spot symptoms on fruit. Note green tissue surrounding the lesions. Longitudinal section of a hard spot lesion on fruit.